EN 15651-1 ed. 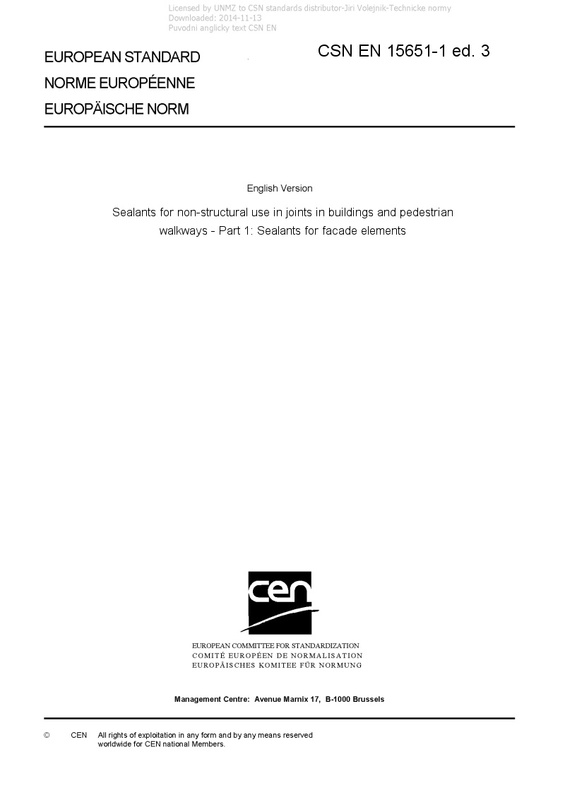 3 Sealants for non-structural use in joints in buildings and pedestrian walkways - Part 1: Sealants for facade elements - This European Standard specifies definitions and requirements for non-structural facade sealants intended for sealing exterior wall joints, window and door perimeter joints in building construction, including the interior face. NOTE Provisions on assessment and verification of constancy of performance - AVCP (i.e. Product type determination and Factory Production Control) and marking of these products are given in EN 15651-5. This European Standard does not apply to non-structural sealants in any of non-paste form, to those used in interior walls and/or partitions and to oil-based mastics.